Disclosure: I received placement on the giveaway form for posting this. No other compensation received. This is such a fun giveaway, and I am really excited to be part of it! I know the kids around my neighborhood would go crazy with this. I constantly see them out in the backyard on there miniature slip and slide, and I can only imagine how much better this would be. The ultimate summer fun, I'm sure! Or you could save it for next year, and make it the ultimate Christmas gift, haha! Anyway, I'll let you guys get to it. Good luck!! 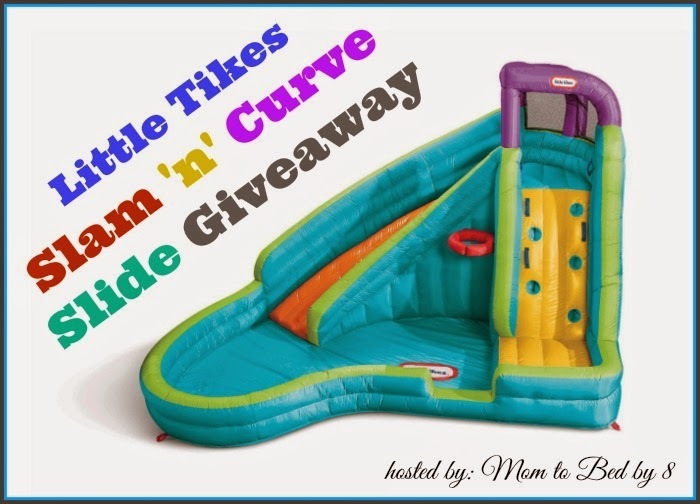 "Sponsored by: LittleTikes.com - Organized by: Mom to Bed by 8 Please take a moment to read Mom to Bed by 8's Little Tikes Slam 'n' Curve Slide review and see how this single waterpark changed her #summerdreams! Dimensions: 10'8"L x 13'1"W x 7'9"H"
Giveaway ends June 30th at 11:59pm, open to US and Canadian residents, ages 18+. Excludes Quebec. Only one entrant per household, per address. Winner is subject to eligibility verification. Enter using the giveaway form below. Good luck! Disclaimer: The participating bloggers were not compensated for this post. No purchase is necessary to enter. One entrant per household, per address. Void where prohibited by law. Winner(s) will be contacted by email and have 48 hours to respond before a new winner is chosen. The sponsor(s) will be responsible for product shipment to winner(s) of this sweepstakes. This event is in no way administered, sponsored, or endorsed by, or associated with, Facebook and/or Twitter, Google, Pinterest. Contact teri@mompoweredmedia.com if you have any additional questions or comments. I would love to own the Tuff Tikes™ Rain Barrel Sandstone. The wet bouncer and the dry bouncer both sound awesome.